Employment by a big company is perhaps, the best job a young educated aspirant would look forward to. Government jobs are preferred in general, to private sector jobs. But, the better educated usually prefer jobs in large private companies. Jobs offered by the large private sector companies are always in good demand. In fact, it matters less whether the company is a public sector undertaking like say, State Bank of India or Bharat Heavy Electricals or a private sector enterprise like say, HDFC Bank or Tata Motors. Large companies are usually considered to be the best employers. We take a look at how good have companies been in increasing their head count in recent years. All Indian companies are not required to reveal the number of people they employ. Only listed companies are required to disclose this. Even this disclosure was made mandatory only in 2014-15. This is a good beginning and deserves to be extended to be applicable to all companies at the earliest. A proxy for growth in head-count would be the growth in what the companies spend on compensation to employees. Growth in this would reflect a growth in the head-count and the growth in wages paid. We find that this growth rate has been falling. CMIE’s Prowess database shows a steady fall in the rate of growth of compensation paid by companies to employees since 2013-14. The Prowess database includes performance information on a large sample of listed and unlisted companies of all sizes and industries. Compensation to employees grew by 25 per cent in 2013-14. The growth rate halved to 12 per cent in 2014-15 and then it fell further to 11 per cent in 2016-17. In 2017-18, the growth rate fell to 8.4 per cent. From this, it wouldn’t be entirely wrong to infer that the corporate sector’s appetite for new hiring has been declining quite sharply. 2017-18 saw the slowest growth in the past eight years, or since the year after the Lehman crisis of 2008 when the compensation to employees grew by only 7.7 per cent. The Prowess database also shows that the corporate sector registered a fall in growth in fixed assets to 6.9 per cent in 2017-18. Growth of investments into the job-creating plant and machinery part of fixed assets was even lower at 5.9 per cent. Both were the lowest since 2004-05. Evidently, the two declines in growth rates – plant and machinery and wages go hand-in-hand. Lack of investments into fresh capacities is hurting growth in employment. We see the same fall in investments in another dataset – CapEx and the same fall in employment in yet another dataset – Consumer Pyramids Household Survey. The evidence of falling growth in investments and employment during the recent past is therefore overwhelming. 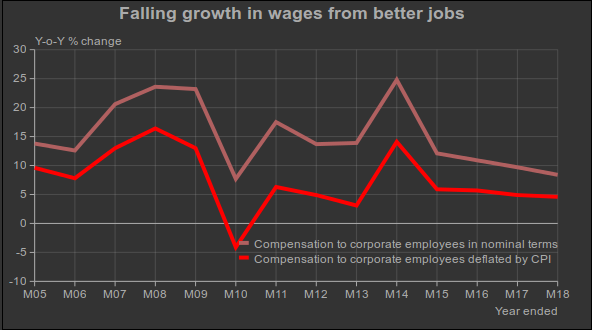 Some of the growth in compensation to employees can be explained as a consequence of inflation and given that inflation has been much lower in recent years compared to the past, it would be good to correct the growth numbers for inflation. We do this using the consumer price index for recent years and the consumer price index for industrial workers for earlier years. Now we see inflation-adjusted compensation to employees grow by only 4.6 per cent in 2017-18. This is lower than the already-low average growth of 5.5 per cent seen in the preceding three years. The average real, i.e. inflation-adjusted, compensation to employees grew at the rate of 5.3 per cent per annum in the four years between 2014-15 and 2017-18. The industry-wise distribution of this growth in inflation-adjusted compensation to employees show some sharp variations between major sectors. The services sector has seen a very small growth in compensation to employees in 2017-18. Compared to the overall growth of 4.6 per cent, the services sector saw a growth of only 2.2 per cent. Within services, it was the telecommunications sector that saw a fall, of 3.6 per cent, in real compensation. This was the fifth consecutive year of fall in inflation-adjusted compensation to employees in this industry. Information technology companies saw a less-than two per cent growth in real wages. Air transport services was another dampener. In contrast, financial markets showed a healthy 8.1 per cent growth in inflation-adjusted wages in 2017-18. Banks recorded a growth of 6.5 per cent and most non-banking financial services industries recorded double-digit growth rates. However, we know that the non-banking finance companies fell into problems in 2018-19. The weak growth in real wages in the IT sector and the apparent implosion in the NBFCs are possibly symptomatic of the despondency over decent jobs in recent times.